IoT is the short term of the Internet of Things. IoT describes how the objects are connected to create a smart world. It refers to network connectivity and computing using sensors and other items. How the devices are connected to the internet and lets to speak about applications. It is widely used in everywhere from home security systems to early flood detection. Why KaaShiv InfoTech Company to learn IoT Training in Chennai? 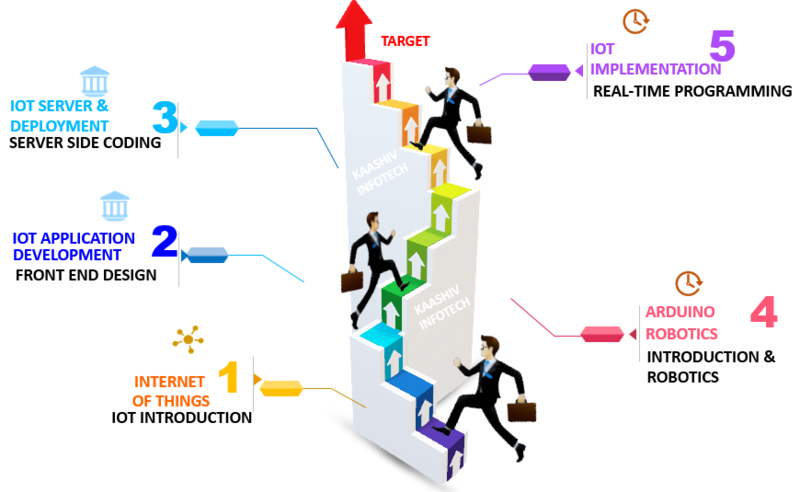 Kaashiv provides Best IoT Training in Chennai with professional trainers who provide real-time training and also projects to the candidates for better understanding. Why Students Enroll for real time IOT Training in Chennai ? IoT interconnects several sensors built-in devices with internet in order to make work easier and efficient. Most of the companies use IoT technology and develops a range of products. The best example is Amazon Echo, the IoT hub product in the market. It reads data through the sensors and processing it with applications in cloud. Then it passes the data to produce unique type of output. Students undergone IoT training will be expertise in IOT ( Internet of Things ) Specialist & IOT ( Internet of Things ) Programming + real time Electronics Implementation. For IoT Training 120 concepts from Basic to Advanced will be covered.